Our hydraulic hose shop is stocked with a full line of hose types for many different applications, and with every configuration of fittings, adapters, and couplers neccesary. 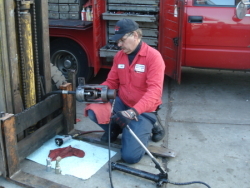 We welcome drive in hose repair requests and provide repair service while you wait using our complete hose line, fittings, and couplers. High pressure hydraulic rubber hose: 1-wire and 2 wire braided from .25" through 1.25" and all fitting possibilities for each. Thermoplastic non-conductive hose for special uses on bucket trucks (.25" - .5"). Cloth jacketed hydraulic hose for high temprature hydraulic applications (.25" - 1"). Special cloth jacketed hose for high temprature special applications and abbrasive locations. Suction line with wire support; Clampable and crimpable (.5" - 1.25"). Return hose: Low pressure oil return also compatible with gasonline and fuel use (.25" - 1"). Stainless/teflon for very high temprature air pressure (.375" - .75". Red air/water hose: Shop air tool hoses, service truck compressor hoses, jackhammer hoses for industrial use, and all related couplers (.375" - 1"). Garden hoses: Industrial quality with any hose end desired (.375" - 1"). Tired of breaking/cracking imported low quality hoses? I'll make you the last hose you'll ever need. Industrial commercial quality with hex brass ends and totally repairable if you somehow hurt it. 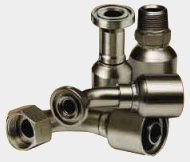 Most related adapters and couplers are available. You choose the size and the length (1ft - 1,000ft). ** Hoses used at PNC Park. Fueling hose: Any length and coupler type for fuel pumping, contractor pumps, etc (.75" - 1"). Propane supply hose for propane supply tanks to propane equipment. Airbrake hose: D.O.T. approved hose for truck and trailer use with crimped or field attachable fittings. Airbrake tubing: D.O.T. approved tubing and all related fittings in stock (.125" - .75"). 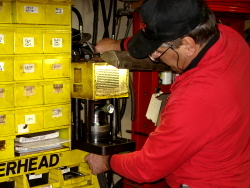 All services and parts are available in shop and on mobile road service calls.